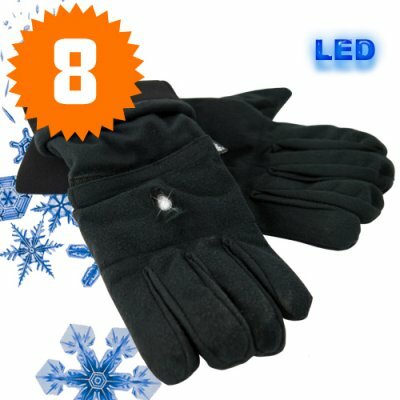 Successfully Added Thermal Winter Gloves with LED Light (Large) to your Shopping Cart. Keep your hands warm with these insulated LED winter gloves. Each glove comes with a built-in LED spotlight making these thermal gloves extra useful for wearing at night or while out exploring the wilderness during the winter. These top quality thermal gloves are made with the best quality materials and come filled with synthetic fiber thermal insulation and double stitched to perfection. A single white beam LED torchlight is installed on the top of each glove to provide you with light during the night or when you are outdoors. These winter gloves are ideal for outdoors enthusiasts or people who like to work at night. If you enjoy camping or you go out a lot at night, then these modern style thermal LED gloves will help you find your way in the dark and keep you warm at the same time. Day or night these gloves will keep your hands protected during the winter months. Stocked in a men's large size, these thermal gloves with LED spot light come at an extra low price and are available in quantities of 8 or more to save on buying and shipping costs. These amazingly gloves are in stock now and available exclusively from the leaders in China Wholesale Electronics, Chinavasion. The LED light switch is located beneath the LED light itself, its very easy to switch on, It's just a matter of feel and touch. You will be able to feel where the light switch is located and just press it to turn on the LED light. Does the CVLJ-H21-L come in any other color or size? This model of thermal glove comes in the "L", large, size. If you need another size, "M" or "S", please contact our customer service team.